Transgénicos made in Uruguay ¿A qué nos exponemos? Y en Uruguay ¿Qué pasa? As Lynas tours the world with his story, we suggest you share these articles with anyone who thinks they want to hear Lynas speak — they can help put the propaganda in perspective. The Mark Lynas scientific misrepresentations will be familiar to anyone who has heard Nina Federoff, Martina McGloughlin, Marc Van Montagu, and other industry-linked GMO proponents talk at universities or scientific conferences. For a list of other frequent speakers who present standard industry PR rather than a thoughtful scientific or social analysis of GMOs seehttp://www.gmwatch.org/myth-makers-m.
Discovering Science: Here’s an amusing article on Mark Lynas and his “discovery of science” by Professor John Vandermeer, University of Michigan.http://www.foodfirst.org/en/GMO+uproar+in+EU Vandermeer encourages Lynas to keep studying and describes some important areas of science he hopes Lynas will learn about in the future. The latest issue of ‘Biosafety Protocol News’, a magazine on the Cartagena Protocol on Biosafety published by the Secretariat of the Convention on Biological Diversity, focuses on the tenth anniversary of the coming into force of the Cartagena Protocol. The contribution from Third World Network (TWN) underlines the need for civil society to gain access to relevant information in order to raise public awareness and promote public participation in decision-making processes regarding LMOs. It also outlines the critical role that civil society has played and continues to play in global and national biosafety discussions, as well as the challenges that remain. From the early days of modern biotechnology, civil society has actively and consistently raised concerns about the environmental, health and socio-economic risks of genetic engineering and its products. 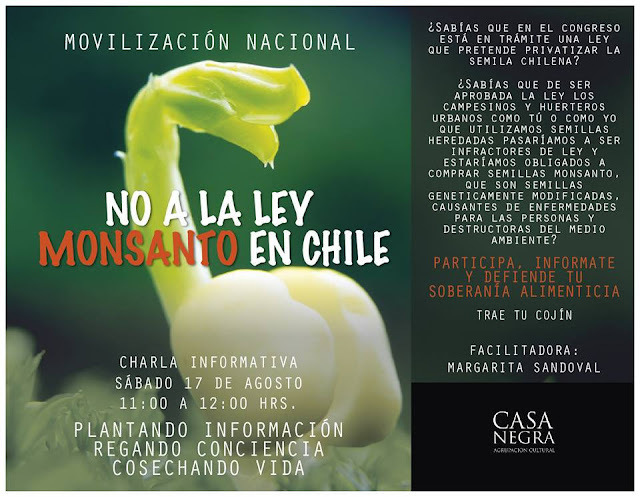 Many non-governmental organizations, farmers’ organizations and indigenous peoples’ organizations have been active in raising public awareness. They have collaborated with scientists engaged in biosafety research by holding campaigns to increase public awareness, education and participation as well as informing policy makers. The efforts of civil society have helped to shape international regulatory frameworks and policies regarding living modified organisms (LMOs), commonly known as genetically modified organisms (GMOs). Information from civil society and scientists helped to shape the discussions leading up to the adoption of the Cartagena Protocol on Biosafety, including the provision on public awareness and participation (Article 23). It also encouraged industry to actively participate in the discussions. Notable civil society contributions include the existing international de facto moratorium on field testing or commercial use of genetic use restriction technology (GURTs). Because GURTs aim to restrict the use of genetic material and their related traits, they are seen as impinging upon the rights of farmers . In 1999, in response to an avalanche of public opposition, two of the world’s largest seed and agrochemical corporations, Monsanto and AstraZeneca (currently Syngenta), publicly committed themselves to not commercialize “Terminator” seeds. Continued public pressure also led the former Director-General of the Food and Agriculture Organization of the United Nations (FAO) to publicly declare FAO’s opposition to “Terminator Technology” as a threat to food security . As a result, several countries, including India and Brazil, currently have legislation prohibiting the use of “Terminator Technology”. Africa’s diversity and knowledge systems are being threatened by corporate and genetically modified (GM) seeds, agro-chemicals, resource grabs and laws that prevent farmers from freely using, sharing or selling their seed. Currently, 80% of seed in Africa is bred by smallholder farmers, who freely save and share seed, resulting in a wide diversity of agricultural crops and a safety net for food security. “We are outraged at the way African governments are being strong-armed into adopting draconian seed laws that ensure the dominance of corporate seeds; giving private breeders monopoly and exclusive marketing rights over seeds” said Elizabeth Mpofu, from La Via Campesina Africa. The ALLIANCE FOR FOOD SOVEREIGNTY IN AFRICA (AFSA) is a Pan African platform comprising networks and farmer organisations working in Africa including the African Biodiversity network (ABN), Coalition for the Protection of African Genetic Heritage (COPAGEN), Comparing and Supporting Endogenous Development (COMPAS) Africa, Friends of the Earth- Africa, Indigenous Peoples of Africa Coordinating Committee (IPACC), Participatory Ecological Land Use Management (PELUM) Association, Eastern and Southern African Small Scale Farmers‟ Forum (ESSAFF), La Via Campesina Africa , FAHAMU, World Neighbours, Network of Farmers' and Agricultural Producers' Organizations of West Africa (ROPPA), Community Knowledge Systems (CKS), Plate forme Sous Régionale des Organisations Paysannes d'Afrique Centrale (PROPAC) and African Centre for Biosafety (ACB). Member countries of COMESA in collaboration with the African Seed Trade Association (AFSTA) and ACTESA (The Alliance for Commodity Trade in Eastern and Southern Africa have drafted seed registration law that will be considered by COMESA governments in September 2013. These draft Regulations create a compulsory regional registration system allowing only marketing of private sector seeds while criminalizing the sale of smallholder farmer varieties that have evolved over centuries. exchanging and selling seeds. Theseframeworks enables corporate take-over of African seeds and undermines seedsovereignty. 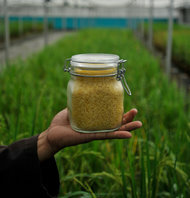 Farmers, scientists and advocates believe that golden rice is but a “simplistic, techno-fix solution” to the prevalence of Vitamin A deficiency and there are other sustainable measures that have no negative impact on human health and the environment. Glyphosate is the world’s most popular herbicide, applied not only on farms but also in forests, parks, public spaces and gardens. It is the active ingredient in Monsanto’s ‘Roundup’ and is regularly used in the widespread cultivation of the company’s Roundup Ready crops genetically engineered to be resistant to glyphosate. For years, industry has claimed that glyphosate is minimally toxic to humans but new studies indicate otherwise. A new Thai in-vitro study on human cells (Item 1) shows that glyphosate induces the growth of human breast cancer cells via estrogen receptors. Even low, environmentally relevant doses were found to stimulate estrogenic activity. In addition, the study found that there was an additive estrogenic effect between glyphosate and genistein, a phytoestrogen in soybeans. This is worrying as glyphosate-based herbicides are widely used in soybean cultivation. Another study found that acute Roundup exposure at low doses for 30 minutes disrupts male reproductive functions by triggering calcium-mediated cell death in rat testis and Sertoli cells (Item 2). Sertoli cells play an important role in sperm cell production and hence male fertility. Glyphosate residues have been found in the main foods of the Western diet, comprised primarily of sugar, corn, soy and wheat. New research by Friends of the Earth detected glyphosate residues in the urine of 44 per cent of people tested from 18 different European countries (Item 3). Another study (Item 4) presents evidence that glyphosate could disrupt gut bacteria, suppress the CYP enzyme class, and likely impair suphate transport, thereby inducing disease. One of the roles of CYP enzymes is to detoxify xenobiotics (foreign chemicals found in a living organism). This means that glyphosate could effectively enhance the damaging effects of other food-borne chemical residues and environmental toxins. According to the authors, the medical conditions to which glyphosate could plausibly contribute to include inflammatory bowel disease, obesity, depression, ADHD, autism, Alzheimer’s disease, Parkinson’s disease, ALS, multiple sclerosis, cancer, cachexia, infertility, and developmental malformations. The researchers call for more independent research to validate the findings presented and if verified, to take immediate action to drastically curtail the use of glyphosate in agriculture. Grist's new food writer fails to see beyond industry spin in his series of articles on GM. GenØk researcher David Quist, in collaboration with researchers at the Instituto de Ecologia, UNAM – Mexico, posted a report as a public hearing in relation to the use of two types of GM maize in Mexican agriculture. Genetically engineered (GE) crops were first approved in the United States in the 1990s, and since then the United States has been the biggest global adopter of this technology. GE crops were supposed to improve yields, lower costs for farmers and reduce agriculture’s environmental impact. Yet nearly 20 years after their introduction, genetically engineered crops have not provided the benefits promised by the companies that patented them. Food & Water Watch examined U.S. Department of Agriculture (USDA) and U.S. Environmental Protection Agency (EPA) data to document the increased use of herbicides that has accompanied the adoption of herbicide-tolerant GE crops. Our analysis looks at the rapid proliferation of GE crops and affiliated pesticides in the United States and points out the interdependent relationship between these two industries that also fuels the crisis of weed resistance. Food & Water Watch evaluated data from the International Survey of Herbicide Resistant Weeds that reveal burgeoning herbicide-resistant weeds caused by the over-reliance on glyphosate for broad control of weeds. These data make it clear that the problem of herbicide-resistant weeds will not be solved with the intensified use of older, more toxic herbicides like 2,4-D and dicamba. • Herbicide use on corn, soybeans and cotton did fall in the early years of GE crop adoption, dropping by 42 million pounds (15 percent) between 1998 and 2001. But as weeds developed resistance to glyphosate, farmers applied more herbicides, and total herbicide use increased by 81.2 million pounds (26 percent) between 2001 and 2010. • The total volume of glyphosate applied to the three biggest GE crops — corn, cotton and soybeans — increased 10-fold from 15 million pounds in 1996 to 159 million pounds in 2012. • Total 2,4-D use declined after glyphosate was widely adopted, but its use has increased since glyphosate-resistant crops became widespread, growing 90 percent between 2000 and 2012. 2,4-D application on corn could easily increase by nearly three-fifths within two years of 2,4-D-tolerant corn’s introduction. And if just a million dicamba-tolerant soybean acres are planted, it would increase dicamba use 17 times. • Reports of weeds developing glyphosate resistance are popping up in more and more states. In 2008, glyphosate-resistant waterhemp was reported in five states, but by 2012 it was reported in 12 states. Glyphosate-resistant Palmer amaranth was reported in eight states in 2008 but 17 by 2012. Resistant horseweed spread from 12 states in 2004 to 21 in 2012. • The International Survey of Herbicide Resistant Weeds found only about one weed infestation per year that was resistant to multiple herbicides between 1997 and 2001, but a decade after GE crops were introduced (2007 to 2011), there were three times as many multiple herbicide-resistant weed infestations. • Herbicide-resistant weeds’ costs to farmers can range from $12 to $50 an acre, or as much as $12,000 for an average-sized corn or soybean farm or $28,000 for an average cotton farm. More biotech industry-led solutions will only perpetuate agriculture’s reliance on chemicals as the end-all-be-all solution to weed and insect management. But this approach drives the rise of superweeds, poses risks to human health and threatens critical habitat for wildlife in the process. • The USDA, EPA and Food and Drug Administration (FDA) must work together to thoroughly evaluate the potentially harmful effects of GE crops and linked chemicals before commercialization, to ensure the safety of humans and the environment. • The USDA should support and encourage cultivation best management practices to prevent weed resistance in the first place. • The USDA should educate and encourage farmers to adopt non-chemical strategies for long-term weed control. The USDA must dedicate research dollars to developing alternatives for sustainable management of herbicide-resistant weeds. • The U.S. government must improve the collection and distribution of weed resistance and agricultural pesticide application data. 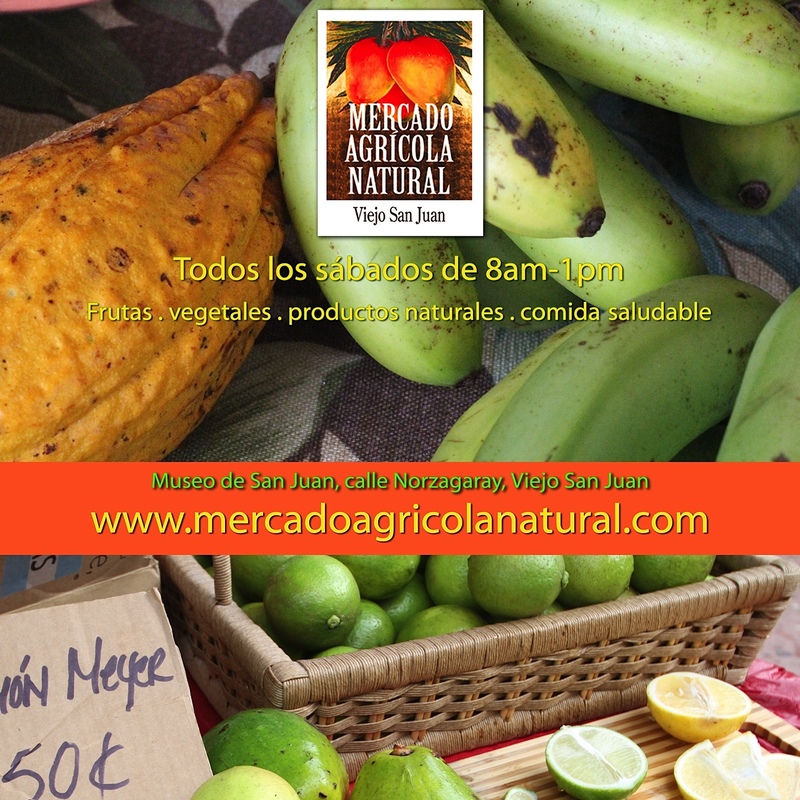 Cultura Profética: Fuera Monsanto de Puerto Rico! El actor Alfonso Herrera te invita a ser un defensor activo del maíz nativo firmando con tu puño y letra la iniciativa "Maíz Libre" en demanda de un marco legal que establezca la moratoria a las siembras del grano genéticamente modificado. Hace ya décadas estaba pronosticado que llegaría el momento en que tener una semilla sería un crimen. Parecía ciencia ficción imaginar que un campesino no podría guardar semillas para la próxima cosecha, como lo había venido haciendo por milenios. Sin embargo, es un hecho. Agricultural biotech corporate giant Monsanto pretty much has had its way in Puerto Rico since it first set up seed breeding operations in the island in 1983. But the last few months have seen a hailstorm of bad publicity and protests against the corporation’s local activities. 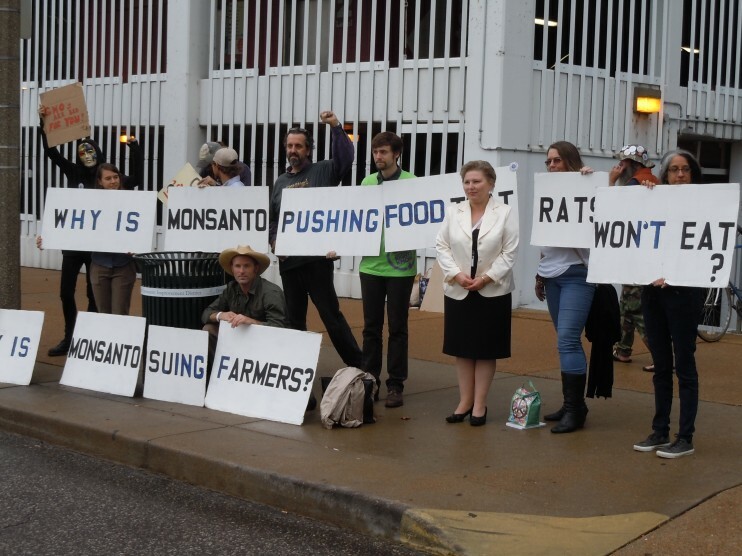 In the city of St. Louis, there is no one who does not have a friend, relative or neighbor working at Monsanto. This city on the banks of the Mississippi river has the doubtful honor of hosting the world headquarters of the Monsanto corporation. Founded in 1901, it was one of the world's leading chemical companies in the twentieth century. At the start of this century it transformed itself into a biotechnology giant, or as the company likes to put it, "a leader in the life sciences industry". Nowadays, Monsanto is the world's largest seed company (global market share: 27%) and owns over four fifths of the planet's genetically modified (GM) seed. 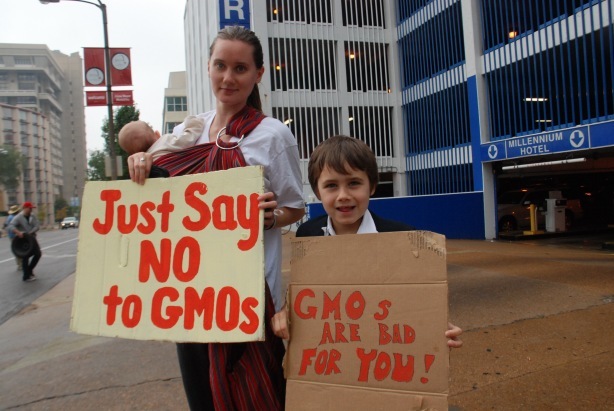 Monday September 17 (2012) was the Occupy Monsanto campaign's international day of actions against the corporation (1). 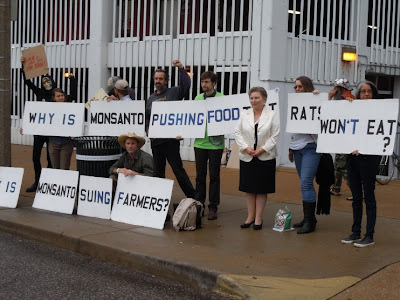 Concerned citizens all over the world were called upon to carry out protest actions at the Monsanto facility nearest to them. Groups as far away as Chile and Argentina picketed Monsanto offices and circulated photos of their actions on social media. That day I was, of all places, in St. Louis picketing the company headquarters' main entrance. I was accompanied by dozens of local activists plus some who came from as far away as Chicago and the San Francisco bay area. A committee of technical experts comprising scientists from top public research laboratories and academic institutions set up by the Supreme Court last year has changed the 10-year moratorium on field trials of Bt transgenics that it recommended in October 2012 to what appears to be an indefinite moratorium on food crops in its final report. Based on “the examination/study of the safety dossiers, it is apparent that there are major gaps in the regulatory system. These need to be addressed before issues related to tests can be meaningfully considered. Till such time it would not be advisable to conduct more field trials,” the experts say in their final report without specifying any time frame.